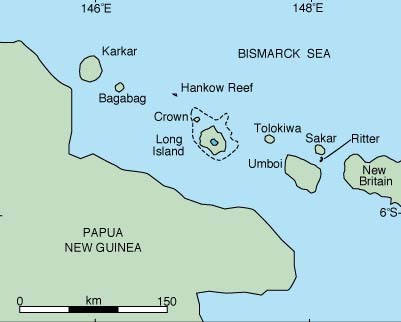 In 1888, a catastrophic eruption destroyed most of Ritter Island, off the coast of Papua New Guinea (the largest ever historical island volcano collapse). As the volcano collapsed it produced a 13m high tsunami , killing hundreds on the shorelines of nearby Umboi, New Britain, and New Guinea. Volcanic activity at Ritter has caused several other small tsunamis before and since 1888, though none nearly as devastating. In 2007 nearby inhabitants were again threatened as much of what was left of the volcanic island slid into the sea.